I’ve taken an unusually long detour away from outdoor adventures lately that has seen me lifting heavy things in a gym. This was due to my dear friend Maria asking if I’d like to enter a powerlifting competition with her. “Sure,” I said, “I like to deadlift.” And so began my foray into some serious lifting. Squats on Mondays. Bench on Wednesdays. Deadlift on Fridays. We started on our own and along the way were adopted by a powerlifter at our gym named Joe. By the end, he was our coach and we all traveled to Las Vegas together for Maria and I to compete at the 2013 IPL World Championships. The title of this bog post gives away most of what happened in Las Vegas yet this summary barely describes what happened in getting there. Maria and I were just a couple of beginner powerlifters transitioning from plenty of high-intensity interval training at Gymnazo. After coming back week after week, Joe began to see we were serious about lifting and so began our relationship with him. One that was genuine and generous. One that enabled us to excel in a way that I have no doubt could not have happened alone. We had a little community in the corner of the gym, lifting heavy things and making a mess with chalk. Practicing a state of being around lifting those heavy things. It was mental and emotional training as much as it was physical training. As for Vegas, what happens in Vegas stays in Vegas, unless it’s live-streamed over the internet. And our competition was live-streamed over the internet from the Grand Ballroom of the Golden Nugget Casino. Maria broke the California deadlift record and I broke the American deadlift record (in our age/weight classes). It’s still a bit unbelievable. 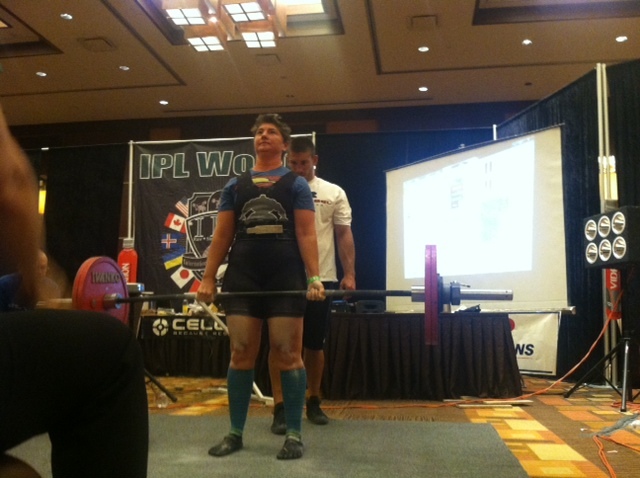 My winning deadlift. 292.11 pounds.